It is better to take a risk now than to always live in FEAR! Adult Belt Saturday 3/9/13 11:00am in Class. LEADERSHIP CLASS Saturday 3/9/13 8:00am. Jhonas Pinkard is the student of the month for March 2013. Johnas Started with AASD back in November of 2011.
which is his strong point, even at age five. Jhonas can always be counted on to give 100% and then some, great job Jhonas. Sifu Rick & staff would also like to salute Jhonas’s parents Oscar & Janine for all their support of not only Jhonas, but of our Black Belt School as well. You reveal your self-respect when you are actively healthy. You care about the health of your body and mind because each is important to the health of the other. Without physical exercise, your brain doesn’t work as well as it could. Without mind exercise, your body won’t operate at peak performance. Caring for your body can include exercise, eating nutritious foods and avoiding activities that are known to be unhealthy. Kickin’ Newsletter’s Health Kick articles are a great source of important health and fitness related information. A healthy person will exercise at least three times per week for 45 minutes. Your martial arts training helps you to fulfill that obligation. Another healthy habit is eating plenty of fruits and vegetables everyday. These foods increase energy and make your body strong to fight illness. “Exercise” your mind with challenging mental activities. For example, read books and other materials that are educational and positive. Physical activities, such as the martial arts, challenge your mind and increase your positive self-image. Health studies suggest that you are more likely to be happier and live longer if you maintain a healthy body and mind. Some of the many healthy habits for your body and mind are listed below. Check how many are already habits with you. Add those you didn’t check to your healthy habits. Eat healthy. Avoid eating fast food regularly and limit intake of sugars and sweet snacks. Be active. The more active you are, the better your body will function. The martial arts, jogging and swimming are just three of many ways to be physically active. Pay attention to your mind. Reading not only calms the mind and body, but also limits negative and stressful thinking. Be thirsty for knowledge. Education is to your brain what physical exercise is to your body. Sleep well every night. Sleep helps your mind and body re-energize for the next day’s activities and challenges. Remember, your mind and body need tender-loving care to be in top condition. Give both enough care and attention, so you do not limit your potential and quality of life. The benefits are well worth the time and effort. I started my martial arts training a little more than four years ago when my Mom and I registered for classes. 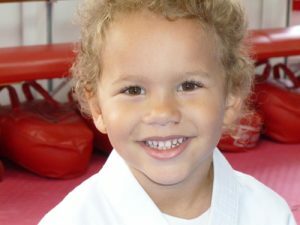 I am a junior Black Belt and junior leader for the Little Ninjas. I’ve also been competing in AAU Karate for about four years. I am a two-time National Champion, and placed second and third in the AAU junior Olympics in Karate in 2004. Martial arts has taught me how to set goals and work hard to reach them. Martial arts also helps me improve my grades in school and teaches me how to focus and be self confident. It has taught me to communicate better with my family and friends. The dojo to me is like being home. My Shihan has taught me that earning my Black Belt means that I’m ready to start learning. 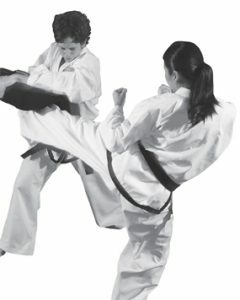 Martial arts is a sport where you learn about humility, self-control, integrity, courtesy, discipline and perseverance. Those are the qualities you need in life. My goal is to teach someday, and I am happy and proud to be a part of my dojo. Kayla Provencher is a student at Pelletier’s Karate Academy in Lewiston, Maine. How Much “Weight” Should you Give Your BMI? ”BMI” is an abbreviation for “Body Mass Index,” a formula, or calculation, that compares your weight to your height. Traditionally, it indicated whether a person should lose weight. BMI is just one of several methods to evaluate your weight, but only in general terms. Example: you weigh 120 lbs. and are 5′ 2″ tall, which is 62 inches. A BMI between 20 and 25 is considered healthy. Remember, your BMI is limited. It does not take into account your lean body mass (LBM), which is the composition of your weight, and how fit you are. You can have a good BMI, but a poor LBM and be unhealthy; or a poor BMI and a good LBM, but be healthy. Waist measurement. Measure your waist at its narrowest point. For women, maximum waist size should be 35 inches, for men, 40 inches. (Keep in mind that these values are for health risk prevention rather than optimal health.) Your waist should always be less than half your height. Waist-to-hip ratio. Measure you hips at their widest point. Divide your waist measurement by your hip measurement. The goal for women is less than .8 and men less than .9.
your martial arts training, but don’t view them as absolute rules.